iDocument is a generic ontology-based information extraction (OBIE) system that uses ontological background knowledge in terms of existing vocabularies and instance knowledge. iDocument uses existing knowledge from personal or business domains (e.g. relational databases, concept maps, taxonomies, etc.). Following Semantic Web, iDocument exchanges and extracts knowledge based on the W3C standard RDF. Existing knowledge is used as input in a serial IE pipeline of extraction tasks for extracting possible answers concerning user specified ad hoc queries on a given text collection. Further developement and research is done in project ​Perspecting. Perspecting is funded by the Bundesministerium für Bildung und Forschung (Federal Ministry of Education and Research) under grant 01IW08002. Domain ontologies are exchangeable as long as they are written in RDFS. The MOBIE mapping vocabulary allows to define relevant classes, attributes and relations for extraction purpose . Extracted results are formalized in the same RDF scheme as the input domain ontology. SPARQL queries are used for defining extraction templates. All intermediate and final extraction results are weighted hypothesis according to Dempster –Shafer’s belief function. ​Publications(1) A list of publications done in project iDocument. ​Publications(2) A list of publications done in project Perspecting. ​Poster A scientific poster that was presented at WM 2009 in Solothurn, Switzerland. ​Flyer A short flyer about the software. iDocument is implemented as service. If you are interested in using it, please contact us. For further information please contact ​Benjamin Adrian (benjamin.adrian@…). szenario.png​ (161.3 KB) - added by horak 10 years ago. 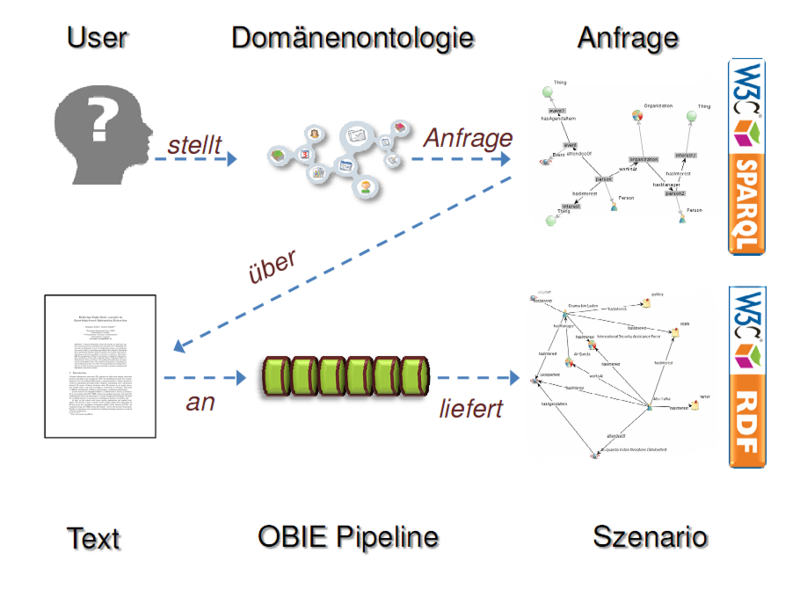 iDocument scenario about extracting information from text via SPARQL by using domain ontologies.